Place all egg yolks and 2 spoons of sugar in a bowl and mix until light and fluffy, then set aside. Pour cream into a pot, add rest of the sugar and heat until bubbles form on the edge. Take off from the heat, add vanilla extract and mix gently to avoid whipping the cream. 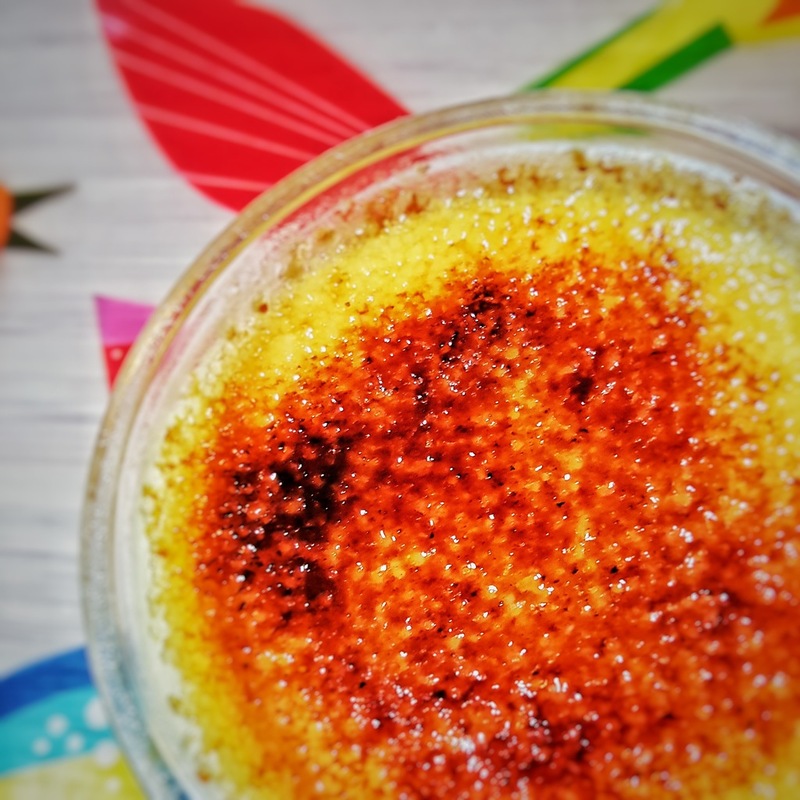 The best crème brûlée is made with heavy cream, but since it's not easily available in Germany, I also use whipping cream (Schlagsahne) and used milk. Lighter creams, or milk, result in a more runny, light and fluffy dessert. Pour very gently few spoons of the warm cream into egg yolks and quickly mix both together to avoid setting (cooking) the yolks. In two or three steps add rest of the cream and mix everything thoroughly. Using a spoon, remove foam that might make an unpleasant skin during the baking process. You want to have the top, the "skin", as smooth as possible, so removing any foam that formed during mixing is essential. Place ramekins in a large baking form, and fill them 2/3 to 3/4 of the height. Try to make them evenly filled. Cover each ramekin with aluminium foil (matte side up, shiny side down) to prevent burning the surface. Aluminium foil will prevent the top from forming and burning an unpleasant skin. Place the large form in the oven, and fill it to at least 2/3 of the ramekin height with boiling hot water. Bake for 20 minutes, then remove and shake gently to see if the inside wobbles, but keeps set. Let the ramekins cool down on the counter, then chill for at least 2 hours in the fridge. 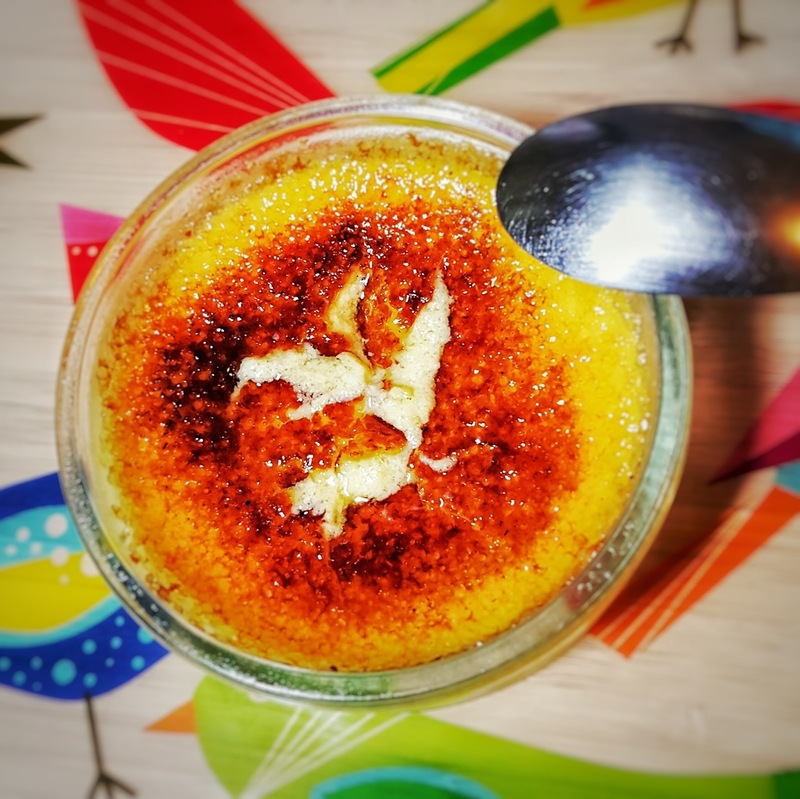 Baking in a bath of hot water will improve the consistency and will prevent your crème brûlée from burning its sides. To serve the crème brûlée, spray 1 teaspoon of sugar on top, gently distribute and caramelize using the blowtorch. The easiest way to caramelize the top is to hold the blowtorch at 45 degree angle, and go from inside to the edge. Sugar doesn't burn instantly, it should melt, then boil, then pretty quickly brown and burn. Aim for the amber-gold color.